After a few rather depressing posts about Gambling, I’m hoping to get back to the lighter side of life. 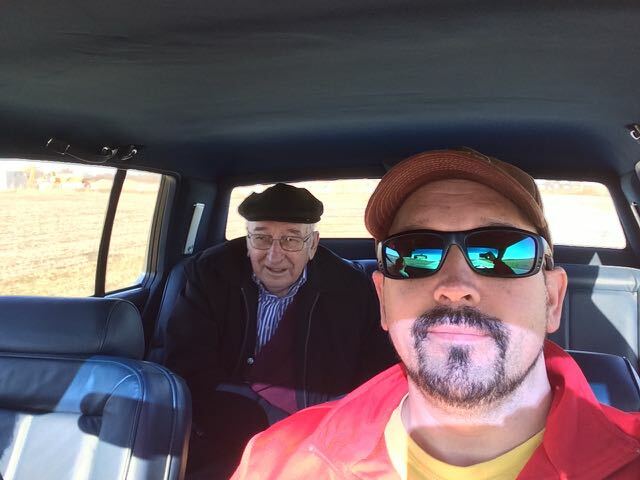 The day after acquiring the Cadillac DeVille, I woke up on Sunday and asked dad if he wanted to go for a drive. It was a gorgeous morning with the sun shining and the promise of an oddly warm December day. “In the new car?” he asked. “Everywhere,” I replied. 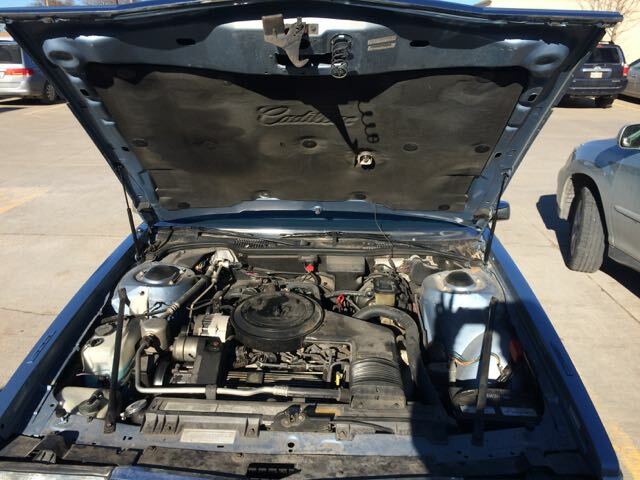 My plan was to go to Valley, Yutan and Gretna to show all of my siblings the new/used car. I was kind of hoping he would want to drive, but he was more comfortable with me behind the wheel. We set off for Valley. I brought along a couple of old mix tapes to test out the tape player. The first one failed, but “One Part” created by sooz back in 1991 or so still worked, so Natalie Merchant’s beautiful voice was singing “Jack Kerouac” and we were on our way. Our first leg of the tour took us down Dodge street all the way to Valley. Dad told me the story of how he got lost trying to find Andra’s house once. Apparently, he was driving to her house, and then he found himself on a “road in Latvia” and somehow ended up at Sue’s house in Gretna instead. True story. This time, we came into Valley on the road by the old 3M plant, and dad recognized the road. Al used to live on the corner, and I pointed out his house. Then dad pointed out that there was a Latvian church around the corner. “Hmmmm,” I thought, but I didn’t correct him. He soon saw a Lutheran church down the street and realized that’s what he meant to say. Vitauts’ favorite thing to do while driving is to point out all the places he remembers and how he has been on various roads “thousands of times” or “how many times have I driven on this road?” He did point out that Andra’s house was hard to find, and he was glad I was driving because I know where I am going. Soon we were at Andra’s house on Church Street. She was surprised to see us, but happy that we showed up. I asked her to come with us to Gretna, and she was in. She took the front seat, and dad sat in the back like a boss. 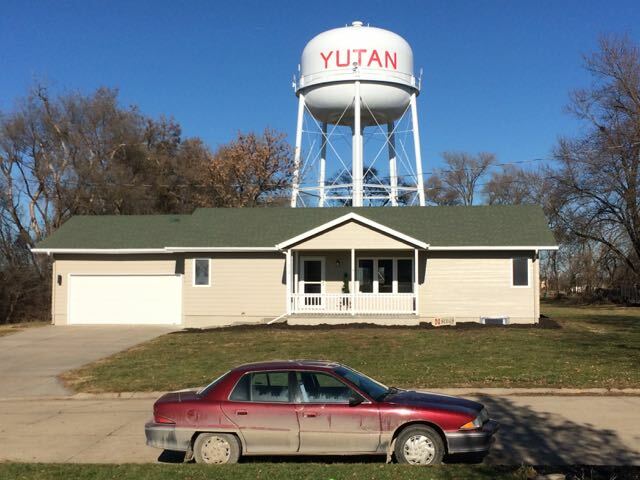 I felt like a chauffeur as we traversed the Nebraska highways toward our old stomping ground in Yutan. Andra and I just kept talking about how smooth the drive was, and dad would interject a comment here and there about where we were and how he kind of recognized some landmarks. He always likes to se the St. John’s church in Yutan that he helped build. 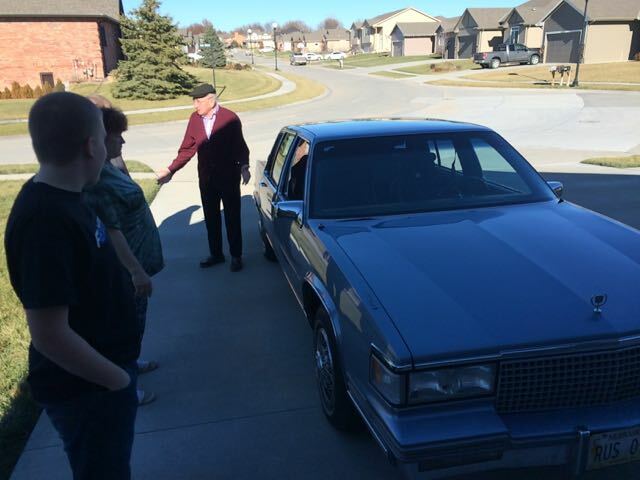 Then we drove up the street to my brother Norm’s house, parked in the driveway and waited. For those of you who don’t know, Norm and his wife Lori bought the house on 511 Vine Street that I grew up in. It’s kind of weird and cool to go back to see the house again. Every time I go back it stirs certain memories. Lori came out to visit with us and with dad as he sat in the back of the Cadillac. On the way out of town he commented on how sad it makes him to go back to Yutan because of all the good times he had there. 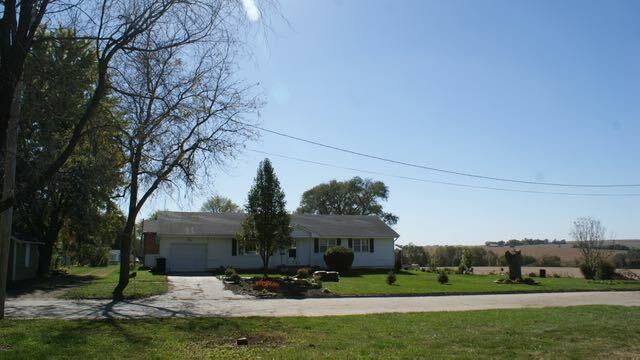 We left and headed toward Gretna for our final stop at Sue and Glen’s house. When we arrived, we were greeted by Glen and his youngest son Alaric. They were both impressed with the car and wanted me to go show Sue who was working at a church event in town. Glen invited us for lunch, so while he grilled burgers, I took Alaric for a ride to see his mom. Sue loved the car and drove it around Gretna on the old brick streets. It glided like a champ over the rough roads. We all had a kick about the number of ashtrays, old lighters and other features from back in the day. 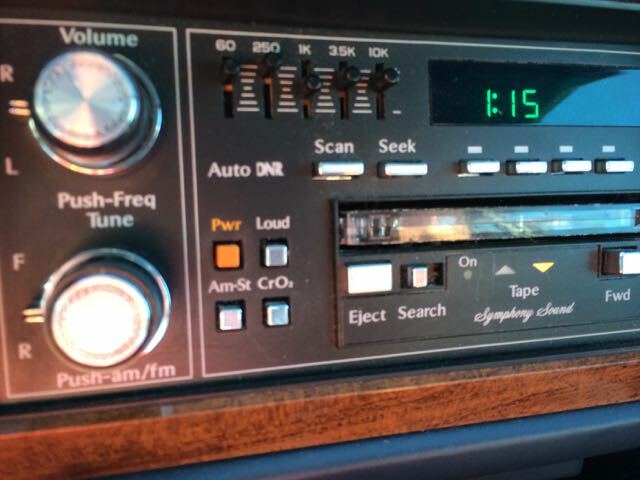 The speedometer only goes up to 85 which, for me, was pretty normal, but kids these days just don’t understand it. 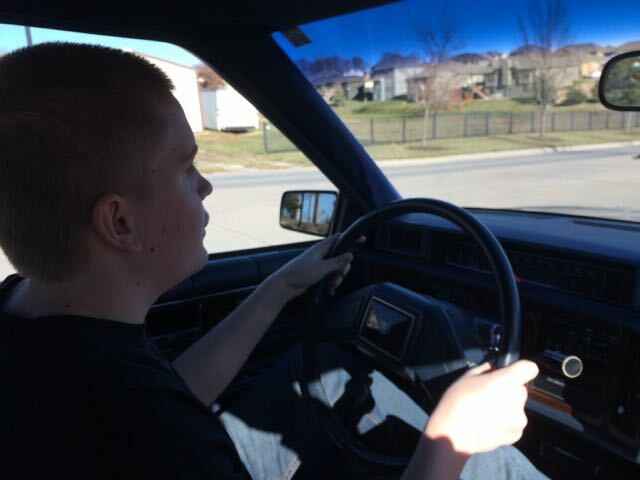 On the way back to Glen’s house, I let Alaric, who is only 14, drive around the block. He was nervous at first, but he did fine. After a wonderful lunch of grilled burgers and a few shots of Fireball, we headed out back toward Valley. I stopped at an auto store and bought a plastic cupholder to compensate from the complete absence of these in the Caddy. I wonder, didn’t we eat and drink in cars back then? Why was the cupholder a novelty that took so long to become commonplace? When we got home from our adventure, dad was all tired out, but I think he had a really good time. At one point, I shut off the new music and popped in one of his old Latvian folk song tapes. He started singing along with fervor in the backseat. Andra and I both listened joyfully as his off-key voice boomed from behind. Latvians and their folksongs... I tell you what. Nice story, but why not a picture of the Yutan house?